Just now got my vellvette box.. I mean Bag! It's always an excitement to see what would be int here!! and this time it’s not the usual black beauty but a pretty pink bag! Ever since, I saw the first bag for this month, I wished I should get something good too which can be used and guess this month’s box is a treat! They are sample sized products but still can be used for couple of times to make an opinion whether you would like to go for the full sized or not! 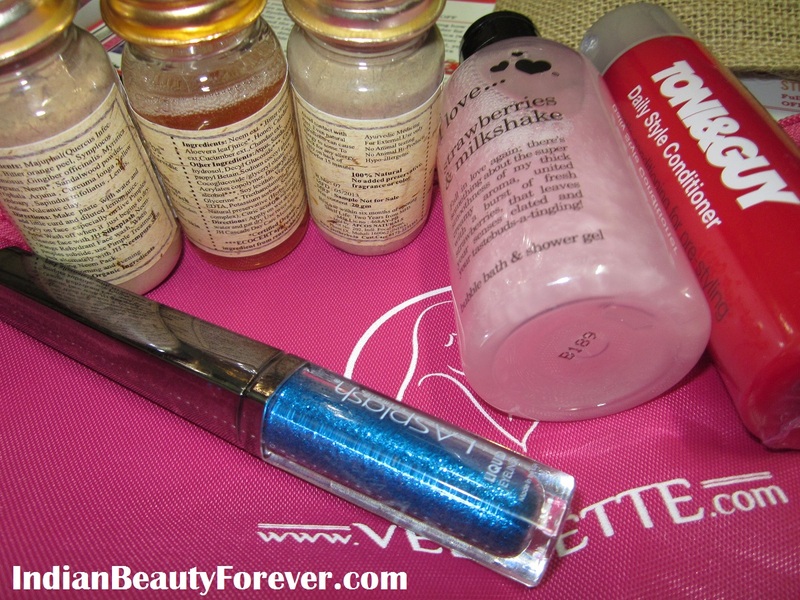 LA Splash glitter eyeliner in Pacific ocean. A bright blue Sparkly eyeliner which is something, I was about to buy anyways. Glad I got this. 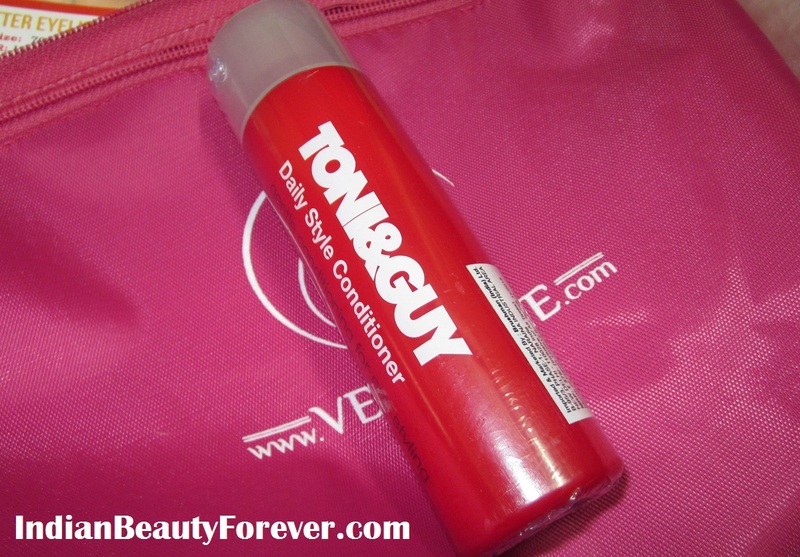 Toni and Guy daily style conditioner. I love conditioners and would love to try this out. In fact I was thinking of trying their styling spray! 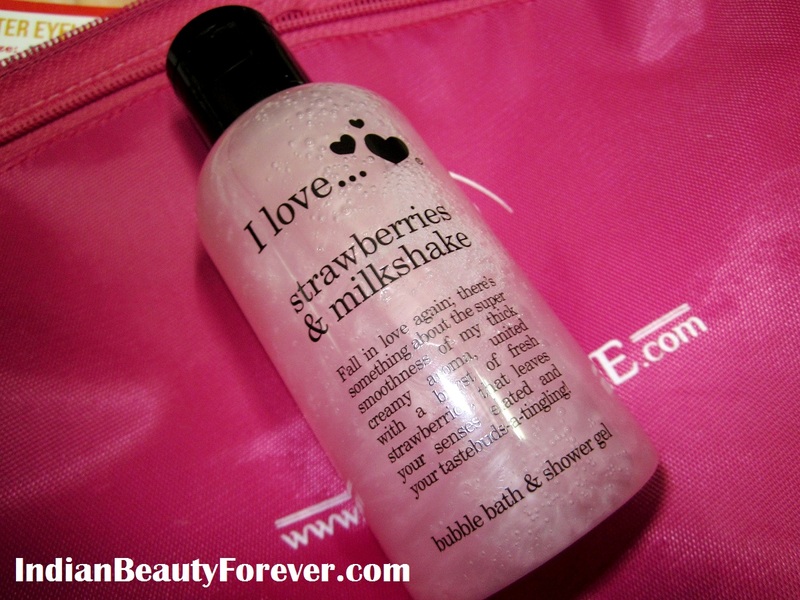 I love strawberry and milkshakes: Great smelling strawberry shower gel. 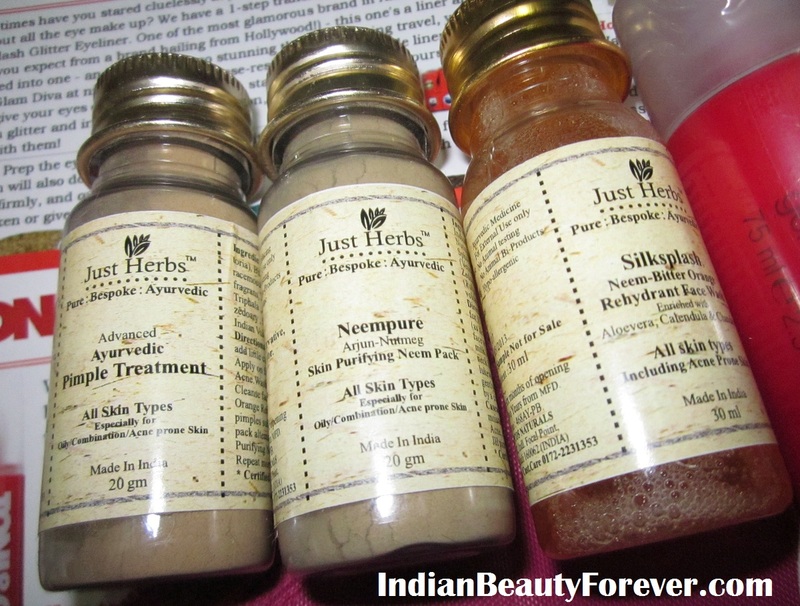 I Am extremely happy with the products I have got this time. There isn’t anything that can’t be used. 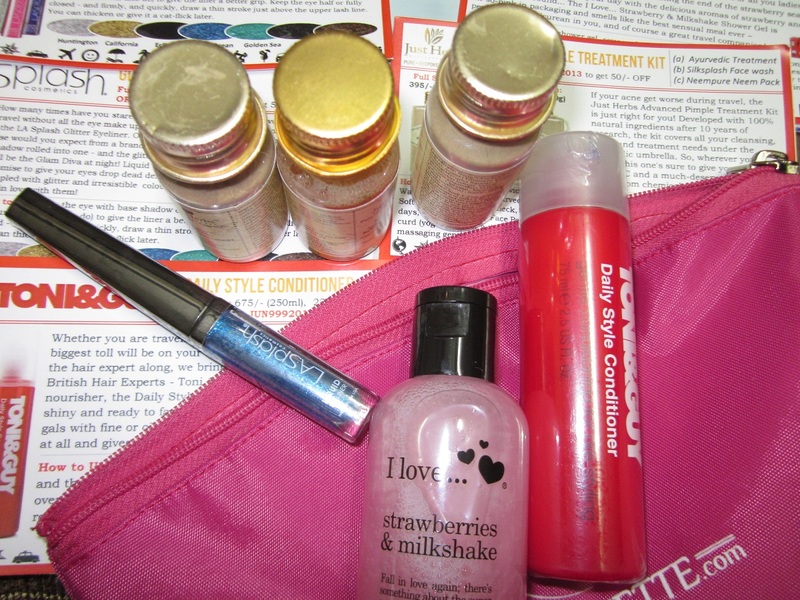 i liked all the products especially the conditioner and pimple kit!! The products look really classy! Indeed Nisha!! Complimentary bag is good too. Great !! I missed it awwwwww :( niesh.. Thanks dear! Everything can be used for sure! Subscribe next month dear and I hope they send something good like this that time too! Exactly thats what used to happen with me earlier Smita. But then I subs for 6 months and thought let's see how comes but surprising and overall, it wasn't a bad deal this time! Your bag is just so drool worthy! 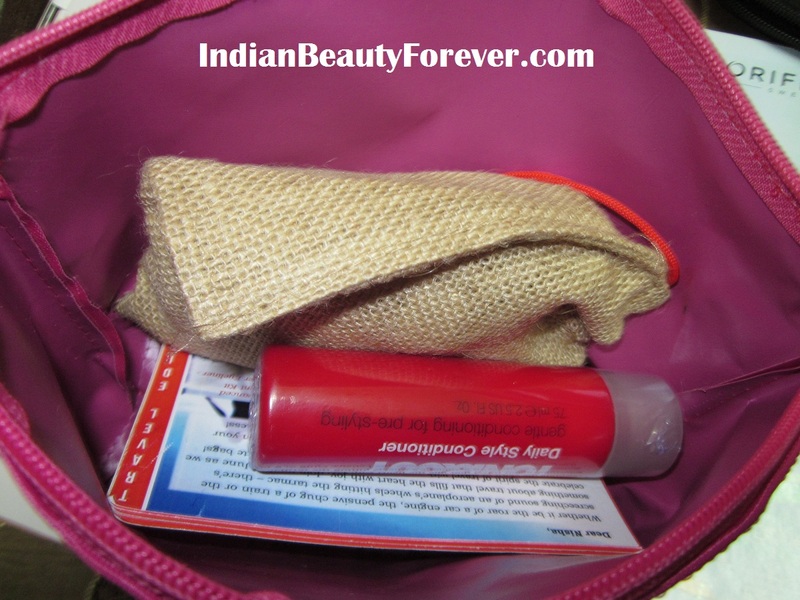 The strawberries gel looks so awesome....If possible, review it soon Niesha! Sure Richa!! it will take only a couple of usage to check and form an opinion about this products! It smells good. You should mail them about this dear. I hope they send your bonus product soon then. I have mailed them. I Think they will sort it out. Eagerly awaiting my bag now. Loved almost all the products you got. I just hope I don't get an electric blue glitter liner....that's just not me. I know you don't like bright liners. :) Hopeyou get yours soon. Even I like the bag katy, it looks good and the shower gel smells yummy! Got the samee products except blueberry shower gel :D Are you an m.m.m.m customer? because I got it as a bonus. Yes Juhi, I am! it was a bonus for me too! The Products Are So DroolWorthy! :D thanks for that Heena. I some up with that soon. Sorry about the comment moderation you had to type in twice!! And the bag is very cute! NICE Nishea! 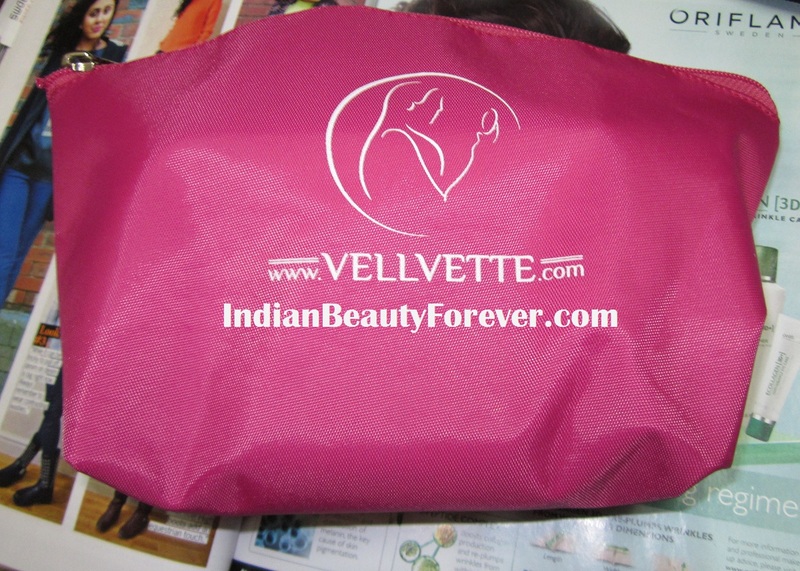 I was thinking of subscribing to Velvette box but due to some people's disappointment with it, I discarded the idea.